When I was about nine years old and my mum was out I decided to make what we called Cream Puffs . You may know them as their more sophisticated name Profiteroles . Back then I did something wrong as the choux pastry was far to runny to stand up in a little peak on the oven tray. Thinking quickly I spooned the mixture into patty pan tins and they came out a little puffed but nothing as grand as they should have been. Filled with cream and dusted with icing sugar they were at least edible. 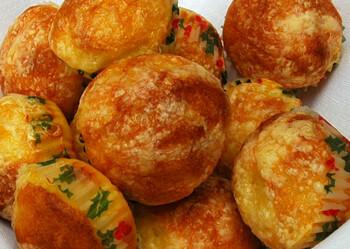 Some years later I read about a savoury version called Gougere . I knew someday I would make them, especially after I saw them here and here . That day finally came this week when I decided they would be perfect for trying out my Christmas present. Everything was going along smoothly, I started adding the eggs and whoops I added a little too much egg and yes my choux pastry again collapsed in a heap on the oven tray. Grabbing some tiny paper baking cases I quickly started tea spooning and baking.....and they turned out perfect little crispy, cheesy puffs. Being dressed in their little paper dresses they freeze well and can just be quickly reheated in the oven for a minute or two to have with your pre dinner drink. The recipe I used can be found here. My tip is to add the egg slowly and do not be tempted to mix it all in. Stop adding egg when you feel the choux is the right consistency to stay up. Then I couldn't get the new lens to do what I wanted it too so resorted back to my old one. I'm still working on producing a picture with the macro I'm happy to share.